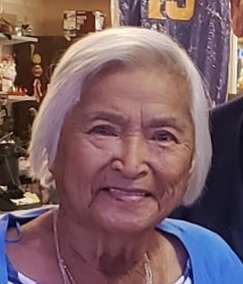 Juanita Carmen Callejo, 84, of Eleele passed away at Wilcox Memorial Hospital on September 7, 2018. She was born in Waimea, Kauai, Hawaii on June 26, 1934 and was a dedicated homemaker. Preceded in death by her daughter, Elsie Jean Callejo; parents, Manuel & Tomasa Esdicul; siblings, Benita Cezar, Leocadio Esdicul, Bertha Kihei, Vicky Moribe and Julian Esdicul. Juanita is survived by her husband, Benjamin Frank Callejo Sr.; daughters, Patricia (Walter) Shaffer, Traci Callejo Planas, Robbyn (Manuel) Silva, Jennifer Callejo; sons, Michael (Clarice) Callejo, Benjamin Frank Callejo Jr., Alan Callejo, Manuel (Imelda) Callejo; 15 grandchildren, 10 great-grandchildren; sister, Fely (Francis) Oniate; brothers, Marcellino (Ruthie) Esdicul, Lucas Esdicul; numerous nieces, nephews and cousins. A celebration of her life will be held on Saturday, October 6, 2018 at Sacred Hearts Church in Eleele with viewing from 8:30 a.m. and Mass celebrated at 10:00 a.m. Burial will follow at Kauai Memorial Gardens.